This article is about consent to medical procedures. For consent in non-medical legal contexts, see Consent. For the House episode, see Informed Consent (House). Informed consent is a process for getting permission before conducting a healthcare intervention on a person, or for disclosing personal information. A health care provider may ask a patient to consent to receive therapy before providing it, or a clinical researcher may ask a research participant before enrolling that person into a clinical trial. Informed consent is collected according to guidelines from the fields of medical ethics and research ethics. An informed consent can be said to have been given based upon a clear appreciation and understanding of the facts, implications, and consequences of an action. Adequate informed consent is rooted in respecting a person’s dignity. To give informed consent, the individual concerned must have adequate reasoning faculties and be in possession of all relevant facts. Impairments to reasoning and judgment that may prevent informed consent include basic intellectual or emotional immaturity, high levels of stress such as posttraumatic stress disorder (PTSD) or a severe intellectual disability, severe mental disorder, intoxication, severe sleep deprivation, Alzheimer's disease, or being in a coma. Obtaining informed consent is not always required. If an individual is considered unable to give informed consent, another person is generally authorized to give consent on his behalf, e.g., parents or legal guardians of a child (though in this circumstance the child may be required to provide informed assent) and conservators for the mentally disordered, or consent can be assumed through the doctrine of implied consent, e.g., when an unconscious person will die without immediate medical treatment. In cases where an individual is provided insufficient information to form a reasoned decision, serious ethical issues arise. Such cases in a clinical trial in medical research are anticipated and prevented by an ethics committee or Institutional Review Board. Informed Consent Form Templates can be found on the World Health Organization Website for practical use. Informed consent can be complex to evaluate, because neither expressions of consent, nor expressions of understanding of implications, necessarily mean that full adult consent was in fact given, nor that full comprehension of relevant issues is internally digested. Consent may be implied within the usual subtleties of human communication, rather than explicitly negotiated verbally or in writing. In some cases consent cannot legally be possible, even if the person protests he does indeed understand and wish. There are also structured instruments for evaluating capacity to give informed consent, although no ideal instrument presently exists. Thus, there is always a degree to which informed consent must be assumed or inferred based upon observation, or knowledge, or legal reliance. This especially is the case in sexual or relational issues. In medical or formal circumstances, explicit agreement by means of signature—normally relied on legally—regardless of actual consent, is the norm. This is the case with certain procedures, such as a "do not resuscitate" directive that a patient signed before onset of their illness. A person may verbally agree to something from fear, perceived social pressure, or psychological difficulty in asserting true feelings. The person requesting the action may honestly be unaware of this and believe the consent is genuine, and rely on it. Consent is expressed, but not internally given. A person may claim to understand the implications of some action, as part of consent, but in fact has failed to appreciate the possible consequences fully and may later deny the validity of the consent for this reason. Understanding needed for informed consent is present but is, in fact (through ignorance), not present. A person signs a legal release form for a medical procedure, and later feels he did not really consent. Unless he can show actual misinformation, the release is usually persuasive or conclusive in law, in that the clinician may rely legally upon it for consent. In formal circumstances, a written consent usually legally overrides later denial of informed consent (unless obtained by misrepresentation). Informed consent in the U.S. can be overridden in emergency medical situations pursuant to 21CFR50.24, which was first brought to the general public's attention via the controversy surrounding the study of Polyheme. Disclosure requires the researcher to supply each prospective subject with the information necessary to make an autonomous decision and also to ensure that the subject adequate understands the information provided. This latter requirement implies that a written consent form be written in lay language suited for the comprehension skills of subject population, as well as assessing the level of understanding through conversation. Capacity pertains to the ability of the subject to both understand the information provided and form a reasonable judgment based on the potential consequences of his/her decision. Voluntariness refers to the subject’s right to freely exercise his/her decision making without being subjected to external pressure such as coercion, manipulation, or undue influence. Waiver of the consent requirement may be applied in certain circumstances where no foreseeable harm is expected to result from the study or when permitted by law, federal regulations, or if an ethical review committee has approved the non-disclosure of certain information. Advance the development of a medical product necessary to the military. Be carried out under all laws and regulations (i.e., Emergency Research Consent Waiver) including those pertinent to the FDA. While informed consent is a basic right and should be carried out effectively, if a patient is incapacitated due to injury or illness, it is still important that patients benefit from emergency experimentation. The Food and Drug Administration (FDA) and the Department of Health and Human Services (DHHS) joined together to create federal guidelines to permit emergency research, without informed consent. However, they can only proceed with the research if they obtain a waiver of informed consent (WIC) or an emergency exception from informed consent (EFIC). The 21st Century Cures Act enacted by the 114th United States Congress in December 2016 allows researchers to waive the requirement for informed consent when clinical testing "poses no more than minimal risk" and "includes appropriate safeguards to protect the rights, safety, and welfare of the human subject." A patient agrees to a health intervention based on an understanding of it. The patient has multiple choices and is not compelled to choose a particular one. The consent includes giving permission. Historians cite a series of medical guidelines to trace the history of informed consent in medical practice. Henri de Mondeville, a French surgeon who in the 14th century, wrote about medical practice. He traced his ideas to the Hippocratic Oath. :63 Among his recommendations were that doctors "promise a cure to every patient" in hopes that the good prognosis would inspire a good outcome to treatment. :63 Mondeville never mentioned getting consent, but did emphasize the need for the patient to have confidence in the doctor. :63 He also advised that when deciding therapeutically unimportant details the doctor should meet the patients' requests "so far as they do not interfere with treatment". Historians cite a series of human subject research experiments to trace the history of informed consent in research. 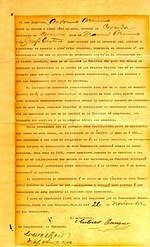 The U.S. Army Yellow Fever Commission “is considered the first research group in history to use consent forms.” In 1900, Major Walter Reed was appointed head of the four man U.S. Army Yellow Fever Commission in Cuba that determined mosquitoes were the vector for yellow fever transmission. His earliest experiments were probably done without formal documentation of informed consent. In later experiments he obtained support from appropriate military and administrative authorities. 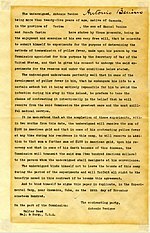 He then drafted what is now “one of the oldest series of extant informed consent documents.” The three surviving examples are in Spanish with English translations; two have an individual’s signature and one is marked with an X.
Tearoom Trade is the name of a book by American psychologist Laud Humphreys. In it he describes his research into male homosexual acts. In conducting this research he never sought consent from his research subjects and other researchers raised concerns that he violated the right to privacy for research participants. The Milgram experiment is the name of a 1961 experiment conducted by American psychologist Stanley Milgram. In the experiment Milgram had an authority figure order research participants to commit a disturbing act of harming another person. After the experiment he would reveal that he had deceived the participants and that they had not hurt anyone, but the research participants were upset at the experience of having participated in the research. The experiment raised broad discussion on the ethics of recruiting participants for research without giving them full information about the nature of the research. Chester M. Southam used HeLa cells to inject into cancer patients and Ohio State Penitentiary inmates without informed consent to determine if people could become immune to cancer and if cancer could be transmitted. The doctrine of informed consent relates to professional negligence and establishes a breach of the duty of care owed to the patient (see duty of care, breach of the duty, and respect for persons). The doctrine of informed consent also has significant implications for medical trials of medications, devices, or procedures. Until 2015 in the United Kingdom and in countries such as Malaysia and Singapore, informed consent in medical procedures requires proof as to the standard of care to expect as a recognised standard of acceptable professional practice (the Bolam Test), that is, what risks would a medical professional usually disclose in the circumstances (see Loss of right in English law). Arguably, this is "sufficient consent" rather than "informed consent." The UK has since departed from the Bolam test for judging standards of informed consent, due to the landmark ruling in Montgomery v Lanarkshire Health Board. This moves away from the concept of a reasonable physician and instead uses the standard of a reasonable patient, and what risks an individual would attach significance to. Medicine in the United States, Australia, and Canada also takes this patient-centric approach to "informed consent." Informed consent in these jurisdictions requires healthcare providers to disclose significant risks, as well as risks of particular importance to that patient. This approach combines an objective (a hypothetical reasonable patient) and subjective (this particular patient) approach. The doctrine of informed consent should be contrasted with the general doctrine of medical consent, which applies to assault or battery. The consent standard here is only that the person understands, in general terms, the nature of and purpose of the intended intervention. As the higher standard of informed consent applies to negligence, not battery, the other elements of negligence must be made out. Significantly, causation must be shown: That had the individual been made aware of the risk he would not have proceeded with the operation (or perhaps with that surgeon). Optimal establishment of an informed consent requires adaptation to cultural or other individual factors of the patient. For example, people from Mediterranean and Arab appear to rely more on the context of the delivery of the information, with the information being carried more by who is saying it and where, when, and how it's being said, rather than what is said, which is of relatively more importance in typical "Western" countries. The informed consent doctrine is generally implemented through good healthcare practice: pre-operation discussions with patients and the use of medical consent forms in hospitals. However, reliance on a signed form should not undermine the basis of the doctrine in giving the patient an opportunity to weigh and respond to the risk. In one British case, a doctor performing routine surgery on a woman noticed that she had cancerous tissue in her womb. He took the initiative to remove the woman's womb; however, as she had not given informed consent for this operation, the doctor was judged by the General Medical Council to have acted negligently. The council stated that the woman should have been informed of her condition, and allowed to make her own decision. To capture and manage informed consents, hospital management systems typically use paper-based consent forms which are scanned and stored in a document handling system after obtaining the necessary signatures. Hospital systems and research organizations are adopting an electronic way of capturing informed consents to enable indexing, to improve comprehension, search and retrieval of consent data, thus enhancing the ability to honor to patient intent and identify willing research participants. More recently, Health Sciences South Carolina, a statewide research collaborative focused on transforming healthcare quality, health information systems and patient outcomes, developed an open-source system called Research Permissions Management System (RPMS). The ability to give informed consent is governed by a general requirement of competency. In common law jurisdictions, adults are presumed competent to consent. This presumption can be rebutted, for instance, in circumstances of mental illness or other incompetence. This may be prescribed in legislation or based on a common-law standard of inability to understand the nature of the procedure. In cases of incompetent adults, a health care proxy makes medical decisions. In the absence of a proxy, the medical practitioner is expected to act in the patient's best interests until a proxy can be found. By contrast, 'minors' (which may be defined differently in different jurisdictions) are generally presumed incompetent to consent, but depending on their age and other factors may be required to provide Informed assent. In some jurisdictions (e.g. much of the U.S.), this is a strict standard. In other jurisdictions (e.g. England, Australia, Canada), this presumption may be rebutted through proof that the minor is ‘mature’ (the ‘Gillick standard’). In cases of incompetent minors, informed consent is usually required from the parent (rather than the 'best interests standard') although a parens patriae order may apply, allowing the court to dispense with parental consent in cases of refusal. Research involving deception is controversial given the requirement for informed consent. Deception typically arises in social psychology, when researching a particular psychological process requires that investigators deceive subjects. For example, in the Milgram experiment, researchers wanted to determine the willingness of participants to obey authority figures despite their personal conscientious objections. They had authority figures demand that participants deliver what they thought was an electric shock to another research participant. For the study to succeed, it was necessary to deceive the participants so they believed that the subject was a peer and that their electric shocks caused the peer actual pain. Nonetheless, research involving deception prevents subjects from exercising their basic right of autonomous informed decision-making and conflicts with the ethical principle of respect for persons. The Ethical Principles of Psychologists and Code of Conduct set by the American Psychological Association says that psychologists may conduct research that includes a deceptive compartment only if they can both justify the act by the value and importance of the study's results and show they could not obtain the results by some other way. Moreover, the research should bear no potential harm to the subject as an outcome of deception, either physical pain or emotional distress. Finally, the code requires a debriefing session in which the experimenter both tells the subject about the deception and gives subject the option of withdrawing the data. In some U.S. states, informed consent laws (sometimes called "right to know" laws) require that a woman seeking an elective abortion receive information from the abortion provider about her legal rights, alternatives to abortion (such as adoption), available public and private assistance, and other information specified in the law, before the abortion is performed. Other countries with such laws (e.g. Germany) require that the information giver be properly certified to make sure that no abortion is carried out for the financial gain of the abortion provider and to ensure that the decision to have an abortion is not swayed by any form of incentive. Some informed consent laws have been criticized for allegedly using "loaded language in an apparently deliberate attempt to 'personify' the fetus," but those critics acknowledge that "most of the information in the [legally mandated] materials about abortion comports with recent scientific findings and the principles of informed consent", although "some content is either misleading or altogether incorrect." As children often lack the decision making ability or legal power (competence) to provide true informed consent for medical decisions, it often falls on parents or legal guardians to provide informed permission for medical decisions. This "consent by proxy" usually works reasonably well, but can lead to ethical dilemmas when the judgment of the parents or guardians and the medical professional differ with regard to what constitutes appropriate decisions "in the best interest of the child". Children who are legally emancipated, and certain situations such as decisions regarding sexually transmitted diseases or pregnancy, or for unemancipated minors who are deemed to have medical decision making capacity, may be able to provide consent without the need for parental permission depending on the laws of the jurisdiction the child lives in. The American Academy of Pediatrics encourages medical professionals also to seek the assent of older children and adolescents by providing age appropriate information to these children to help empower them in the decision making process. Research on children has benefited society in many ways. The only effective way to establish normal patterns of growth and metabolism is to do research on infants and young children. When addressing the issue of informed consent with children, the primary response is parental consent. This is valid, although only legal guardians are able to consent for a child, not adult siblings. Additionally, parents may not order the termination of a treatment that is required to keep a child alive, even if they feel it is in the best interest. Guardians are typically involved in the consent of children, however a number of doctrines have developed that allow children to receive health treatments without parental consent. For example, emancipated minors may consent to medical treatment, and minors can also consent in an emergency. Informed consent is part of the ethical clinical research as well, in which a human subject voluntarily confirms his or her willingness to participate in a particular clinical trial, after having been informed of all aspects of the trial that are relevant to the subject's decision to participate. Informed consent is documented by means of a written, signed, and dated informed consent form. In medical research, the Nuremberg Code set a base international standard in 1947, which continued to develop, for example in response to the ethical violation in the Holocaust. Nowadays, medical research is overseen by an ethics committee that also oversees the informed consent process. As the medical guidelines established in the Nuremberg Code were imported into the ethical guidelines for the social sciences, informed consent became a common part of the research procedure. However, while informed consent is the default in medical settings, it is not always required in the social science. Here, research often involves low or no risk for participants, unlike in many medical experiments. Second, the mere knowledge that they participate in a study can cause people to alter their behavior, as in the Hawthorne Effect: "In the typical lab experiment, subjects enter an environment in which they are keenly aware that their behavior is being monitored, recorded, and subsequently scrutinized. ":168 In such cases, seeking informed consent directly interferes with the ability to conduct the research, because the very act of revealing that a study is being conducted is likely to alter the behavior studied. List exemplifies the potential dilemma that can result: "if one were interested in exploring whether, and to what extent, race or gender influences the prices that buyers pay for used cars, it would be difficult to measure accurately the degree of discrimination among used car dealers who know that they are taking part in an experiment." In cases where such interference is likely, and after careful consideration, a researcher may forgo the informed consent process. This is commonly done after weighting the risk to study participants versus the benefit to society and whether participants are present in the study out of their own wish and treated fairly. Researchers often consult with an ethics committee or institutional review board to render a decision. The Facebook study controversy raises numerous questions about informed consent and the differences in the ethical review process between publicly and privately funded research. Some say Facebook was within its limits and others see the need for more informed consent and/or the establishment of in-house private review boards. Other, long-standing controversies underscore the role for conflicts of interest among medical school faculty and researchers. For example, coverage of University of California (UC) medical school faculty members has included news of ongoing corporate payments to researchers and practitioners from companies that market and produce the very devices and treatments they recommend to patients. Robert Pedowitz, the former chairman of UCLA’s orthopedic surgery department, reported concern that his colleague’s financial conflicts of interest could negatively affect patient care or research into new treatments. In a subsequent lawsuit about whistleblower retaliation, the University provided a $10 million settlement to Pedowitz while acknowledging no wrongdoing. Consumer Watchdog, an oversight group, observed that University of CA policies were “either inadequate or unenforced…Patients in UC hospitals deserve the most reliable surgical devices and medication…and they shouldn’t be treated as subjects in expensive experiments.” Other UC incidents include taking the eggs of women for implantation into other women without consent and injecting live bacteria into human brains, resulting in potentially premature deaths. ^ Elsayyad, Ahmed (2014). 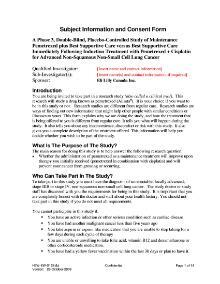 "Informed Consent for Comparative Effectiveness Trials". New England Journal of Medicine. 370 (20): 1958–1960. doi:10.1056/NEJMc1403310. ^ "WHO | Informed Consent Form Templates". who.int. Retrieved 14 September 2014. ^ Faden, R. R.; Beauchamp, T. L. (1986). A History and Theory of Informed Consent. New York: Oxford University Press. ISBN 978-0-19-503686-2. ^ Beauchamp, Tom L.; Childress, James F. (1994). Principles of Biomedical Ethics (Fourth ed.). New York: Oxford University Press. ISBN 978-0-19-508536-5. ^ McManus, J., J; S. G. Mehta; et al. (2005). "Informed consent and ethical issues in military medical research". Academic Emergency Medicine. 12 (11): 1120–1126. doi:10.1111/j.1553-2712.2005.tb00839.x. PMID 16264083. ^ a b c Baren, Jill. "Informed Consent to Human Experimentation". Springer Publishing Company. Retrieved 26 September 2013. ^ Pace, Eric (26 August 1997). "P. G. Gebhard, 69, Developer Of the Term 'Informed Consent' - New York Times". The New York Times. New York: NYTC. ISSN 0362-4331. Retrieved 5 March 2014. ^ a b c d e f g h i j k l m n o p q r s t u v w x y z Faden, Ruth R.; Beauchamp, Tom L.; King, Nancy M.P. (1986). A history and theory of informed consent (Online ed.). New York: Oxford University Press. ISBN 978-0-19-5036862. ^ Katz, Jay; Alexander Morgan Capron (2002). The silent world of doctor and patient (Johns Hopkins Paperbacks ed.). Baltimore: Johns Hopkins University Press. pp. 7–9. ISBN 978-0801857805. ^ Gregory, John (1772). Lectures on the Duties and Qualifications of a Physician. ^ Cutter, Laura (2016). "Walter Reed, Yellow Fever, and Informed Consent". Military Medicine. 181 (1): 90–91. doi:10.7205/milmed-d-15-00430. PMID 26741482. ^ "The U.S. Army Yellow Fever Commission in Cuba - U.S. Army Yellow Fever Commission". U.S. Army Yellow Fever Commission. Retrieved 2017-08-01. ^ a b Babbie, Earl (2010). The practice of social research (12th ed.). Belmont, Calif: Wadsworth Cengage. ISBN 978-0495598411. ^ a b c Baumrind, D. (1964). "Some thoughts on ethics of research: After reading Milgram's "Behavioral Study of Obedience."". American Psychologist. 19 (6): 421–423. doi:10.1037/h0040128. ^ Skloot, Rebecca (2010). The Immortal Life of Henrietta Lacks. New York: Braodway Paperbacks. p. 130. ^ "Health Sciences South Carolina". healthsciencessc.org. Archived from the original on 11 October 2014. Retrieved 14 September 2014. ^ Chalil Madathil, K.; Koikkara, R.; Gramopadhye, A. K.; Greenstein, J. S. (2011). "An Empirical Study of the Usability of Consenting Systems: IPad, Touchscreen and Paper-based Systems". Proceedings of the Human Factors and Ergonomics Society Annual Meeting. 55: 813–817. doi:10.1177/1071181311551168. ^ Chalil Madathil, K.; Koikkara, R.; Obeid, J.; Greenstein, J. S.; Sanderson, I. C.; Fryar, K.; Moskowitz, J.; Gramopadhye, A. K. (2013). "An investigation of the efficacy of electronic consenting interfaces of research permissions management system in a hospital setting". International Journal of Medical Informatics. 82 (9): 854–863. doi:10.1016/j.ijmedinf.2013.04.008. PMC 3779682. PMID 23757370. ^ Sanderson, I. C.; Obeid, J. S.; Madathil, K. C.; Gerken, K.; Fryar, K.; Rugg, D.; Alstad, C. E.; Alexander, R.; Brady, K. T.; Gramopadhye, A. K.; Moskowitz, J. (2013). "Managing clinical research permissions electronically: A novel approach to enhancing recruitment and managing consents". Clinical Trials. 10 (4): 604–611. doi:10.1177/1740774513491338. PMC 4213063. PMID 23785065. ^ "HSSC/RPMS · GitHub". github.com. Retrieved 14 September 2014. ^ 2. American Psychological Association. (2002). "2010 Amendments to the American Psychological Association ethical principles of psychologists and code of conduct". Retrieved 30 April 2012. ^ Taupitz, Jochen; Weschka, Marion (2009). CHIMBRIDS - Chimeras and Hybrids in Comparative European and International Research: Scientific, Ethical, Philosophical and Legal Aspects. Volume 34 of Veröffentlichungen des Instituts für Deutsches, Europäisches und Internationales Medizinrecht, Gesundheitsrecht und Bioethik der Universitäten Heidelberg und Mannheim. Springer Science & Business Media. p. 298. ISBN 9783540938699. ^ Dieper, Susanne (23 February 2012). "The Legal Framework of Abortions in Germany". American Institute for Contemporary German Studies. Johns Hopkins University. Retrieved 3 April 2015. ^ Gold, Rachel and Nash, Elizabeth.State Abortion Counseling Policies and the Fundamental Principles of Informed Consent, Guttmacher Policy Review, Fall 2007, Volume 10, Number 4. ^ Richardson, Chinue and Nash, Elizabeth. "Misinformed Consent: The Medical Accuracy of State-Developed Abortion Counseling Materials", Guttmacher Policy Review Fall 2006, Volume 9, Number 4. ^ Committee on Bioethics (1995). "Informed consent, parental permission, and assent in pediatric practice" (PDF). Pediatrics. 95 (2): 314–7. PMID 7838658. ^ "Guideline For Good Clinical Practice" (PDF). Retrieved 2018-09-24. ^ Homan, R. (1991). The Ethics of Social Research. London; New York: Longman. ISBN 978-0-582-05879-8. ^ Levitt, S. D.; List, J. A. (2007). "What Do Laboratory Experiments Measuring Social Preferences Reveal about the Real World?". Journal of Economic Perspectives. 21 (2): 153–174. doi:10.1257/jep.21.2.153. JSTOR 30033722. ^ List, J. A.; List, J. A. (2008). "Informed Consent in Social Science". Science. 322 (5902): 672. CiteSeerX 10.1.1.418.1731. doi:10.1126/science.322.5902.672a. PMID 18974330. ^ Levitt, S. D.; List, J. A. (2009). "Field experiments in economics: The past, the present, and the future". European Economic Review. 53 (1): 1–18. doi:10.1016/j.euroecorev.2008.12.001. ^ Kramer, Adam; Guillory, Jaime; Jeffrey, Hancock (2014). "Experimental evidence of massive-scale emotional contagion through social networks". PNAS. 111 (24): 8788–90. doi:10.1073/pnas.1320040111. PMC 4066473. PMID 24889601. ^ LANIER, Jaron. "Should Facebook Manipulate Users?". The New York Times. Retrieved April 26, 2015. ^ Boyd, Danah. "What does the Facebook experiment teach us?". Social Media Collective Research Blog. Retrieved April 26, 2015. ^ Watts, Duncan. "Stop complaining about the Facebook study. It's a golden age for research". The Guardian. Retrieved April 26, 2015. ^ Grimmelmann, James. "Illegal, Immoral, and Mood-Altering How Facebook and OkCupid Broke the Law When They Experimented on Users". Medium. Retrieved April 26, 2015. ^ Salganik, Matt. "After the Facebook emotional contagion experiment: A proposal for a positive path forward". Freedom to Tinker. Retrieved April 26, 2015.